We've had a very nice weekend, just doing normal life with Chrissy so there isn't a lot of news. Who wants to hear about cleaning the storage spaces under Homer? No, I didn't think so. I should have taken photos of some of the stuff that has accumulated, but didn't. How's this instead? 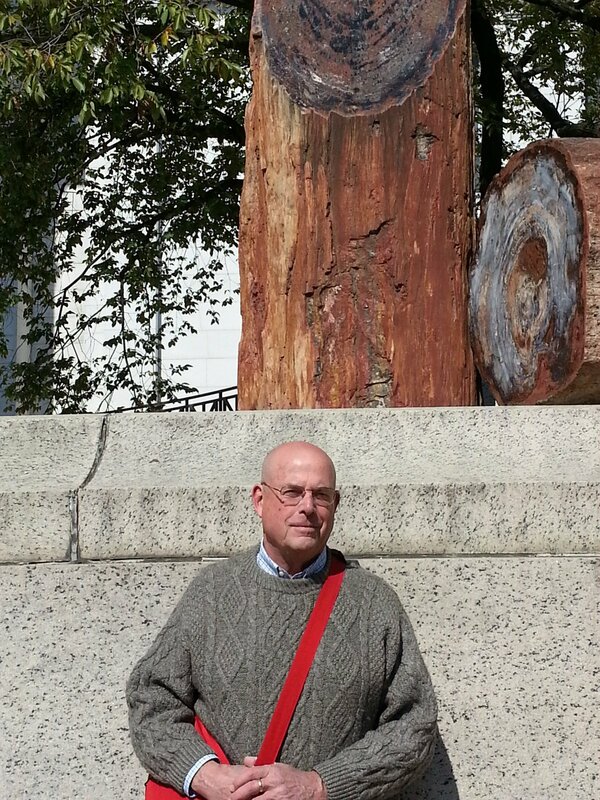 Al Petri at the Smithsonian with a huge petrified tree. We're in Marietta (Atlanta) to spend three weeks with Chrissy, Nicholas and Matthew. The really nice part is that we can see them every day but still sleep in our own bed. There wasn't a lot of sleeping for Nick on Thursday night because of the excitement of the high school Freshman football game. In the very last minute he kicked the winning field goal - 47 yards! 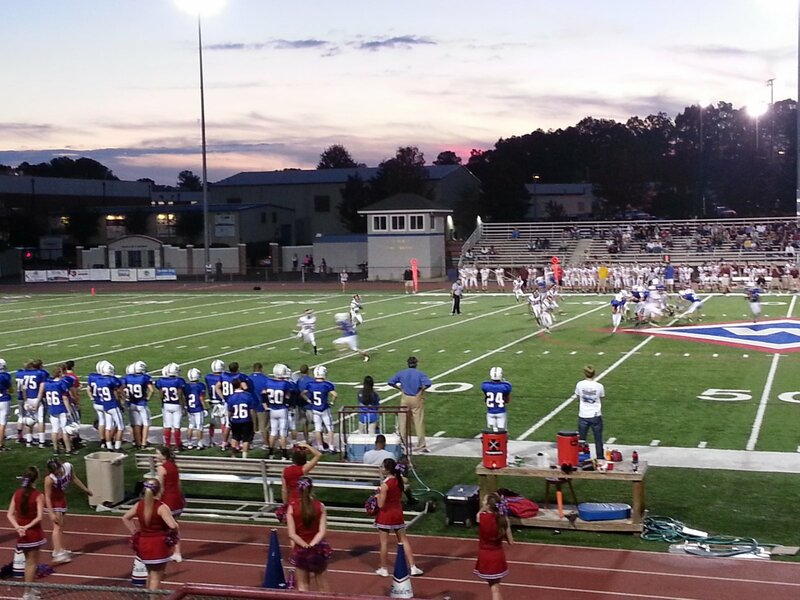 The weather was perfect, the sun was setting, the cheerleaders were adorable, and Nick was the hero! James K. Polk? Well, a house in Pineville, NC that belonged to somebody else from the same period but moved to the site of his home. Well, across the street from his original home but on property that his father owned. Nothing is as it seems. He did much for America, including acquire California, New Mexico and the Oregon Territory. There is a lot more, but you'll have to look it up. He wasn't a healthy guy and worked so hard that he died only three months out of office at the age of only 53! We had a fine day in Charlotte, which is the second largest financial center (New York, in case you were going to ask) in America. The parts we saw and clean and active and pretty. We spent a few wonderful hours at the Mint Museum Uptown, which houses American paintings, the current exhibit shows works by Robert Weir and two of his 16 children. (What's with these people?) It's impressive, but I was more awed by the glass and woodwork creations. There are so many clever and patient people in this world. Did you know that Patrick Henry had 17 children? That is not a typo. Really. Look it up. the 22-year old he married when he was 41. Here we are in Richmond, which is a town filled with history and also very pretty. Instead of writing all about the White House of the Confederacy I snapped the sign. This is an exceptional example of "Sherman's neckties, Sherman's bowties or Sherman's hairpins.". These were from the destroyed railroad lines, heated until they were malleable and twisted into loops, often resembling neckties. This way the lines into could not be easily rebuilt. Doesn't it look like modern art? The photographer's skills aren't too good, but this is the very table on which the terms of the surrender were written. Next time I'll take lessons from Ansel Adams so it's better. Here is the McLean House, in the very small village of Appomattox Court House. Well, this is the reconstruction of the original house, which was dismantled by a speculator who was going to rebuild it elsewhere, but that never happened. General Grant was looking for a comfortable place to meet General Lee and he convinced the family to let them use their drawing room for a while. The pregnant Mrs. McLean had five small children and apparently was not pleased with all the soldiers tramping mud through her house. The National Park rangers told us how graciously the Union Army accepted the weapons from the Thin Blue Line. Once again the country was united. Now we're in a very nice KOA north of Richmond where the autumn colors of Virginia are gorgeous. After a day without presidential museums (the drive-by at Woodrow Wilson's doesn't count) we went to James Madison's Montpelier. This is the view from the basement kitchen window. Not bad. Mr. Madison, the oldest of 12 children, was hailed by his peers as the "Father of the Constitution," which he developed after months of study in his library of over 6,000 books. His list of accomplishments is extensive, but the most impressive is marrying Dolley Payne Todd, who was 17 years younger and 3 1/2" taller, (he was the smallest President to date at 5'4" and just 100 pounds) and they were married for 41 years until his death at the age of 85. Historians seem to agree that she was the first First Lady, politically astute, charming, gracious, and a flamboyant fashion trendsetter. Remember the story of how she famously saved the portrait of George Washington when the British set fire to the White House in 1814. What a woman! A life-sized statue of James and Dolley. www.montpelier.org is a great website if you are interested in more info. The Rotunda at the University of Virgina, which was designed by Thomas Jefferson. Not just the Rotunda, but the entire beautiful campus, with lots of gardens and quiet study retreats. With a telescope he could watch the construction from Monticello. Isn't it nice that it is being maintained? Today's favorite sighting is "St. Isidore the Farmer Catholic Church" in Orange, VA, but we drove by too quickly to get a picture. Doncha love it? The leaves are beginning to turn and it's gorgeous on the edge of the Blue Ridge Mountains. Makes me want to get a plaid wool pleated skirt, knee socks and loafers. And a gooey caramel apple. beautiful cows, - no, not cows but big hunky steers - pigs, chickens, and turkeys. Yes, turkeys can be beautiful. Especially on the Thanksgiving table, next to a bowl of fluffy mashed potatoes and a boat of creamy gravy. Woodrow Wilson, the 28th President was born in this house in Staunton. I'm sure he was a fascinating guy, but but we are on presidential museum overload. What is it about Virginia? Eight Presidents were born here: George Washington, Thomas Jefferson, James Madison, James Monroe, William Harrison, John Tyler, Zachary Taylor, and Woodrow Wilson. Just down the street was a fascinating shop with spinning and weaving and an owner who was eager to show us her skills. It would have been rude not to buy that gorgeous hand-dyed red yarn, right? Just like it would have been impolite to taste wine and not buy any. Yes, Virginia, there really are vineyards in Virginia. He held more major offices than any other President: Senator; Minister to France, England, and Spain; Governor of Virginia; Secretary of State and of War; and fifth President of the United States. And the last President who was one of the Founding Fathers, the third to die on July 4. (Jefferson and Adams, in case you were wondering) He was instrumental in the Louisiana Purchase, and the Monroe Doctrine, of course. When he and Elizabeth left Washington they moved 2 1/2 miles away from Jefferson's Monticello and lived at Ash Lawn-Highland for 26 years. This white oak tree is nearly 300 years old. The farm/museum is available for parties and weddings if you're looking for a good venue. What a busy week! We left New York and went to Atlantic City. It didn't take long to see that. If only either of us loved to gamble or needed to shop, but after a stroll along the Boardwalk, we were pretty much finished. On to Wilmington, DE, which is very pretty, but we weren't there long enough to explore much. Did you know that's where the du Pont company began with the manufacture of gunpowder? There is a terrific museum explaining it and all the things that have changed our lives since then. Impressive. We were lucky enough to get tickets to see "The Outgoing Tide," a play on its way to New York. Starring Michael Learned, Peter Strauss and Ian Lithgow, as a family dealing with Alzheimer's, but funny and clever. See it if you get a chance. Then to College Park MD/Annapolis/Washington, where we had so much fun with Pat, Emily, Oliver, Lachlan and Gigi, along with two days in our Nation's Capital. 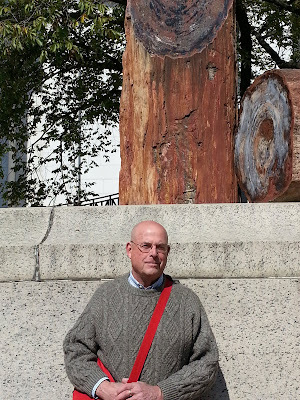 It took one day to visit the Smithsonian and many of the monuments and memorials and another day to see the Capitol Building and the Library of Congress. Wow! I want to spend an entire week in the Library so will have to come back because tomorrow we're going to Charlottesville, VA. Hurry! We are in New Jersey, at the Liberty Harbor RV park. From our window the view includes the new Tower. The ferry took us across the Hudson and a bit of wandering around the new World Financial Center and Lower Manhattan. Federal Hall was the British city hall and became the seat of the new American government and is the very spot where George Washington was sworn in as our first President. The original building was replaced in 1842, which became the U.S. Customs House and Sub-Treasury. Now it is part of the National Park Service and is an interesting museum. It's just across the street from the Stock Exchange so easy to find next time you're in town. This is the view of the Brooklyn Bridge and the Manhattan Bridge from the restaurant in the South Street Seaport. It was a delightful way to celebrate 26 years of wedded bliss. Today we met friends for lunch and saw "Peter and the Starcatcher,"which is a fabulous show. What a great experience the trip was, but there is nothing like America! We're in New Haven, where we got the RV and truck out of storage this morning. How comfy it will be to sleep in our own bed. In the last two months we have been in twelve hotel rooms, two cruise ships, ten airplanes, three rental cars, two trains, and countless city trains, trams and taxis. And one funicular. Al could probably tell you how many restaurants because he kept every receipt. I'll be back with more reports as soon as the laundry and mail is under control - and I get over the shock of the number on the scale. Maybe I'll pretend it's metric.